When our Editor asked me to review and rate travel pillows, I was happy that she chose me for this assignment. I was excited to put my personal twist on sleeping habits and the pillows that we use to accomplish this. I love to travel, and I love to sleep! Growing up in the city of Chicago, I could sleep through just about anything. Planes flying in and out of Midway airport, noisy snow plows and construction trucks, never-ending commuter trains carrying people in and out of the big city, first responders and their loud sirens, cats fighting, dogs barking, children scampering in the streets, and the very lengthy freight trains hauling commerce through our busy hub of the Great Lakes region. Economic development was roaring, and so was my snoring! I could sleep for hours – anywhere and anytime. No pillow, no problem. On the days that I worked in Chicago, I had a two-hour commute (to and from), do you know what I used that time for? You guessed it, sleeping! I caught myself numerous times falling asleep and upon awakening realized that I had used the shoulder of the kind gentlemen sitting next to me. There was no shame in my game when it came to sleeping. Fast forward a few years, I found myself working the night shift in a hospital. I worked twelve-hour shifts, and sometimes sixteen hours. I recall the only thing I could think of when wandering through my front door in those early mornings was SLEEPING! Sadly, the wicked game of working when I should be asleep, and sleeping when I should be at work, completely halted my ability to sleep – at all. Never did I know the pain and suffering of those difficult sleepers that struggled on a day to day, or night to night basis. Fast forward a few more years, and here we are. I still struggle with sleeping, but I am thrilled to be able to review and rate the best travel pillows out on the market today. I am doing this for you, our readers (and for me, the under-achieving fellow non-sleeper)! I love to travel, and sleeping the travel time away is about the best use I can think of! Let’s find the perfect pillow for you to give you the rest and relaxation your body needs, and possibly a few ZZZ’s too! Coming in at our number one pick is the Cabeau Evolution Classic Memory Foam Travel Pillow. We really admire the softness of this pillow and we, at DrivrZone, are giving it five ZZZZZ’s! The quality is fabulous, making it one of the most comfortable travel pillows you will find on the market today. This travel pillow comes with a carrying case and is made with sturdy cotton and polyester fabric and is machine washable to give you years of pleasure. This travel pillow is soft and comfy, built with a thin back and raised sides. This design allows for greater support at the most critical points - your neck, head, and chin. Made with quality memory foam, guaranteed to not push your head forward in that uncomfortable position. This travel pillow gives you the support you want and the quality you need. This travel pillow places high on our list for many reasons, but one of the most important is that it comes with a removable velour cover for machine washing. Constructed of 80% cotton, and 20% polyester, it’s soft and comfortable on the neck, face, and chin. This product is designed well, with all the support you need for those long road trips or flights. We really like the durable memory foam and extra neck support. The cover comes off for easy machine washing. It's no surprise the Cabeau Evolution Classic Memory Foam Travel Pillow took our number one position - it is a fantastic value for the cost! Coming in at our number two spot is the Pon Travel Luxury Foam Pillow. This was another of our favorites because of the enhanced support design. We really like how ergo-friendly it is and the angled protection for the spine. This allows for a more natural fit and keeps your head from bobbing. This pillow also comes with a soft eye mask and memory foam earplugs to guarantee a peaceful rest when traveling via trains, planes, or automobiles. 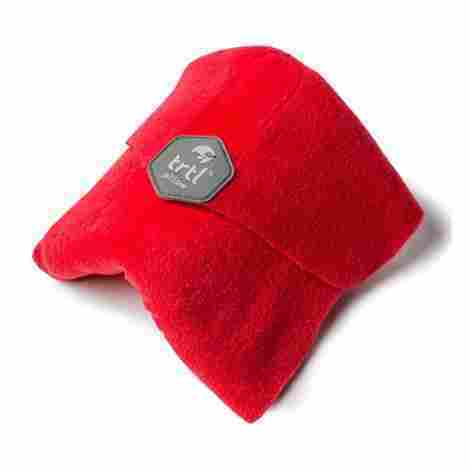 This travel pillow is made with a 5-second rebound memory pillow center, making it comfy and breathable. The pillowcase is made of a soft polyester velvet-like velour allowing for greater comfort. It is removable and machine washable and is crease-resistant. It also comes with an adjustable cord to give the user a more personalized custom fit. Everyone loves a bonus with their purchase and we have one for you! When you buy the Pon Travel Foam Pillow, they will give you not one, but two bonuses! You will receive a nice storage bag, an adjustable sleep mask, and memory foam earplugs. What’s not to love about this travel pillow? The quality of this pillow is great, the design is perfect and the additional accessories you receive with your purchase makes this a great value for the cost! Whirling in at our number three is the Daydreamer Inflatable Neck Travel Pillow. When selecting this pillow, we truly wanted to give our readers a few alternatives because we all know, like no two people are alike, neither are travel pillows. 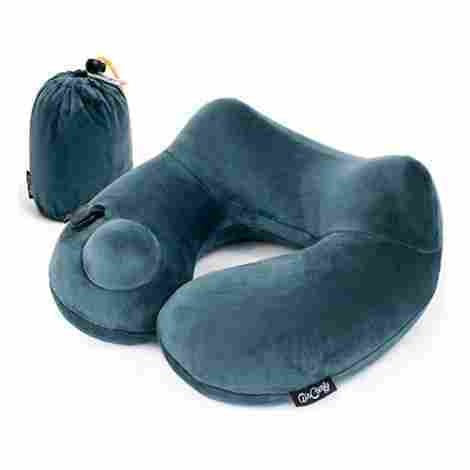 We really like the ergonomic idea of this travel pillow. It may be basic u-shaped but there is nothing basic about it. This travel pillow has no memory foam, gel or beads - but does come with a handy inflation pump button making for a more individual fit. This travel pillow also comes with a removable velvet-like pillowcase for machine washing. No bulk and extra fabric and it deflates in seconds to a small compressed size that can be clipped on to your satchel, travel bag, luggage, or purse. As with most of our travel pillows that we are studying today, this pillow comes with a removable case for washing. No more drool stains and can be laundered as much as needed to assure a clean refreshing experience every time you use it. We like how easy this product is to use. Simply take it out of the provided carrying bag, open it up, and inflate with ease with just a push of a button pump. Giving you that individual support, you need. This can also be adjusted while you are wearing it. When finished using, simply pack it back down and place into the lightweight sack and clip it back on to your travel bag. It is just that easy! We really like this alternative as it gives our readers options, and that’s what we do here at DrivrZone – we review and rate and give our readers options! This one ranks high on our list because it is lightweight and can be packed in the smallest of bags, or clipped onto a purse, briefcase or luggage. Great value for the money! Landing in our fourth position is the Trtl Travel Soft Neck Support Pillow. Again, here at DrivrZone, we enjoyed reviewing and rating all types of travel pillows and giving our readers a variety of quality choices for individual needs. Here is a great ergo-friendly alternative when it comes to travel pillows. No more bobble-heading when you use this quality-made pillow. Made with a plush fleece material with a unique embedded internal support wrapped in an extra cushion, this pillow is sure to give you a more peaceful rest whether you are commuting to work or traveling on vacation. Color isn’t everything, but we like that we have options when it comes to color. This soft neck pillow is offered in black, grey, red and coral so you can express your style with color! Because this is a soft neck support pillow, it is a true space-saver when it comes to packing for your trip. Weighing in at only one-half pound it can easily be attached your travel bag handle, suitcase or work satchel. Although this soft neck pillow is a little more costly, we feel it's ergo-friendly design makes it well worth your money. 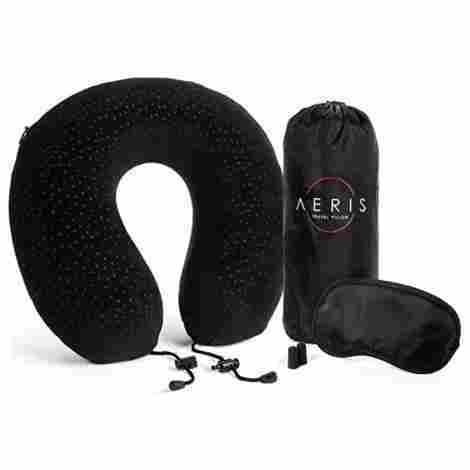 Flying in at number five is the Aeris Travel Pillow. If you are looking for a traditional u-shaped travel pillow at a moderate cost – this one is for you! Here are just a few reasons why this pillow was reviewed and rated and our list today. The memory foam is made with visco-elastic temperature sensitive material, meaning it forms around the contour of your neck. It is also made with ventilation holes to allow constant air-flow so you do not get too warm and uncomfortable. Relieve muscle tension in your neck on those trips and arrive well-rested. See below why we like this travel pillow so much! Always one of our favorite features is a machine washable capability. This neck pillow comes with a detachable (hidden zipper) cover, allowing for easy machine washing. We recommend that you wash the pillow cover regularly to avoid germs and dirt build-up that can accumulate while using (drool, lotions, aftershave, make-up). 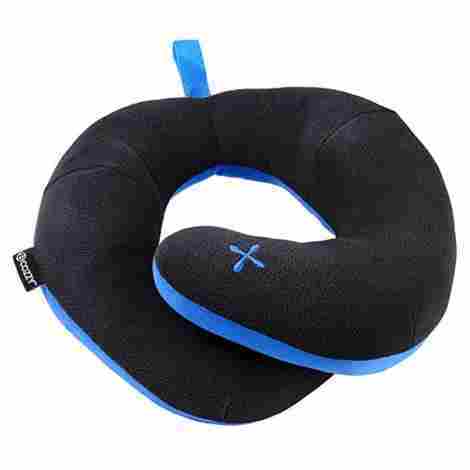 This is an excellent travel pillow, and it comes with a soft eye mask with an elastic band and memory foam earplugs help the traveler fall asleep faster and stay sleeping longer. Although they are basic, we like that the company offered additional sleep aids for their travelers. This travel pillow is an all-around great product. From the temperature-sensitive memory foam with retractable toggle cords to the plush pillow cover that is machine washable, this is a sound purchase. If you are searching for a solid u-shaped tradition travel pillow, and you need to relieve stress and tension while traveling and arrive at your destination fully rested – this is a dependable travel pillow choice. Appearing at number six is the J-Pillow, and it’s no wonder why it is our writer’s favorite. This is a superior design, providing chin and neck support and preventing your head from bobbing forward. Quality made with polyester fiber preventing you from getting warm and sweaty. This travel pillow allows for full-support by twisting and adjusting for various positions to allow for a custom personalized fit for all. This inventive travel pillow is ideal for air travel, trains, cars and just about anywhere you need to take a pause from the hustle and bustle of life, giving you a well-rested relaxing nap. We love the J-shaped design, providing complete head, neck, and chin support for all the traveling you may do. This is an incredible alternative to the traditional u-shaped pillows. The “J” in the pillow is adjustable to be used for the right or left side of your neck. Giving you that perfect individual fit, which works well for flying whether you are seated in an aisle or window seat. This travel pillow has a snap and loop fastening that can be attached to travel bags, luggage, and handbags. It does not compress easily (which is also a good thing) but is manageable if you are packing it into a suitcase. We like that this pillow is completely machine washable. No need to dismantle your travel pillow, just toss it in the washer on delicate and dry on low heat, and it comes out appearing new and ready for your next travel destination. This J-shaped pillow is a dynamic and versatile travel pillow. We believe it is priced accurately for the quality of the support you are getting! Enjoy hours of pleasant rest and relaxation from this uniquely designed pillow. Wow! 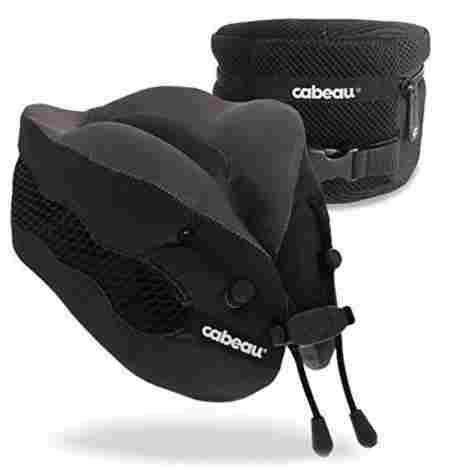 We really enjoyed reviewing this Cabeau Evolution Cool Travel Pillow. This is an extremely revolutionary design. It positively would have rated higher on our list if it wasn’t for how high-priced it is. Truth be told, you do get what you pay for, and we actually believe it worthy and merits being on our top 10 list. This travel pillow is composed of quality made memory foam that provides the maximum comfort for side tilted and forward tilted comfort. Superb ventilation technology which allows your neck and head to remain cooler, assuring a peaceful rest on those long flight or road trips. Many distinguished features with this pillow, let's share them with you below! We favor the moisture wicking material, enabling a cooler sleep experience - allowing for a more comfortable nap without a warm and sweaty feeling. This travel pillow is created with cooling vents to provide better air-flow to ensure a peaceful continuous sleep. This travel pillow gives 360 degrees of total comfort with a custom adjustable magnetic fasteners for a personalized individual fit. We love the well-made travel bag that comes with this pillow. 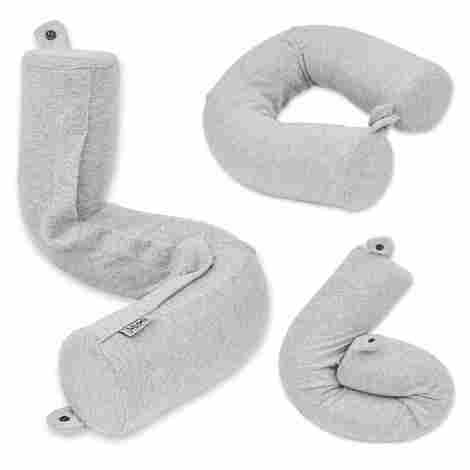 This neck pillow can be compressed half its size making it suitable for packing and carrying purposes. This pillow is manufactured to fit most headphones for a secure satisfactory fit. This pillow also boasts two strategically placed pouches to store small items along with a plastic clip to attach to your luggage, travel bags, or satchel. Quality made, and all the bells and whistles will cost you on this model. If you spend a lot of time traveling, and comfortable sleeping ranks high on your list, and you have the budget to do so - check out the Cabeau Evolution Cool Travel Pillow. We truly admire our number eight pick. The Huzi Infinity Pillow is a different alternative to the legendary u-shaped pillows on the market today. This is an original design by Huzi, featuring the infinity shaped travel pillow that allows for multi-purpose use. It’s like an over-stuffed infinity scarf. For those who do not know what an infinity scarf is; it is a circle of fabric that has no beginning and it has no end. Imagine a large soft material without ending seams, that can be twisted, folded, looped, and wrapped in many positions for that precise customize fit. The possibilities are endless for where you can use this while you sleep during your short and long journeys. High-quality materials are utilized to create this smart little travel aid. 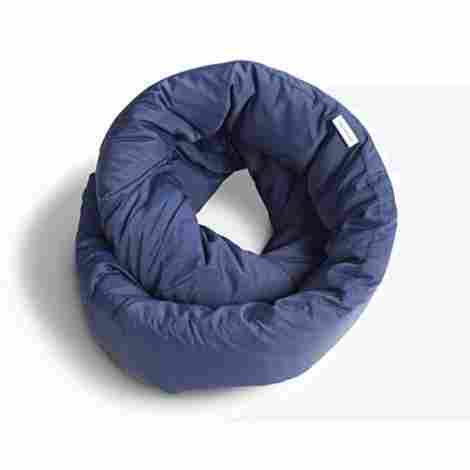 This infinity travel pillow is made of soft breathable bamboo, cotton microfiber fabric. Balancing ability and the coolness of the fabric makes this pillow delightful to use for hours of rest and relaxation. The microfiber expands and intertwines to build a soft comfortable cushion to help ease muscle tension, helping you relax completely. Hypoallergenic, this antimicrobial material is machine washable and the entire pillow can be washed after every trip to ensure a refreshing pillow every time. We love the versatility of this infinity travel pillow. It can be used at least eight different ways (check out the instructions), and we are confident that the consumer will surely think of more! Versatile and flexible, this pillow can be used just about anywhere. Take your infinity travel pillow with you on car road trips and airplane flights for the perfect head, neck and shoulder support. Can be placed behind your back for lumbar support, and against a window for side sleepers against the window. The possibilities are endless! If solid sturdy neck support is for you, this may not be your pillow. However, if you enjoy being cradled in a soft luxury scarf-like product and it’s in your budget – this travel pillow is for you! This pillow can be used just about any way you can think of. Road trips, school, flights and more – rest easy with the Infinity Travel Pillow. Number nine is taken by the Twist Memory Foam Travel Pillow. Here at DrivrZone, we like giving our readers choices. This pillow is not to disappoint! Unlike most common u-shaped pillows, this flexible travel pillow bends to almost any configuration and provides you with individual customized support for maximum tension relief. This pillow is versatile and adjustable with a jointed inner-core. See below why this s-shaped pillow made our list! A few simple clicks and this travel pillow is ready to give you lasting hours of peaceful sleep or quick satisfying naps. This snap-like feature allows for easy contouring and support for your neck, shoulders, and chin. This pillow can also be placed behind your back for pain relief of pressure points in the lumbar area, and also behind your knees for those weary leg muscles. We appreciate the flexibility and versatility this travel pillow offers its consumers. We chose this travel pillow for a few obvious reasons. We really like the adjustable twistable pillow, allowing for personalized support. The pillow cover comes off for easy machine washing to ensure it looks new and clean for years to come. The cost reflects the quality, therefore making this a quality buy! This s-shaped travel pillows offers multi-use purpose, and we like that in a pillow. The price is accurate for what you get. 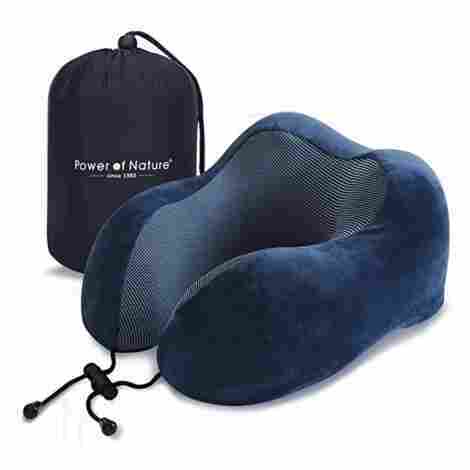 The comfort and flexibility for the support of your head, neck, shoulders, chin and back is what you will receive when you buy this travel pillow. 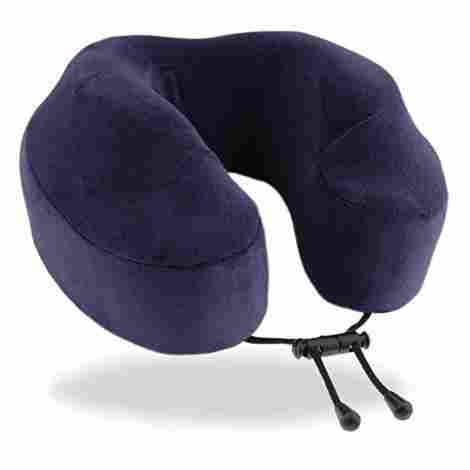 Wheeling out our top ten is the Bcozzy Chin Supporting Travel Pillow. It’s that expected traditional u-shaped travel pillow, reinvented with an added length for chin support which prevents the head from bobbling. Although it is not customizable, it does come in various sizes including children sizes for those kiddos in their car seats that need extra head support. These travel pillows are designed with a narrow back, and higher sides to ensure decent support for your neck, head, and chin. This is a rather simple design, but it works. The material is satisfactory and does support the head, neck, shoulders, and chin. This u-shaped travel pillow can be tossed into the washing machine for easy cleaning. Good travel pillow that can be used on long road trips, flights or simply relaxing at home reading or watching television. This travel pillow comes in a few different neck sizes. We really appreciate that this company also offers children’s sizes as well. There is nothing more frustrating while driving than watching your child’s head bobble forward and from side to side without while they are trying to sleep. The color choices are plentiful, allowing each child (and adult) to choose their very own. 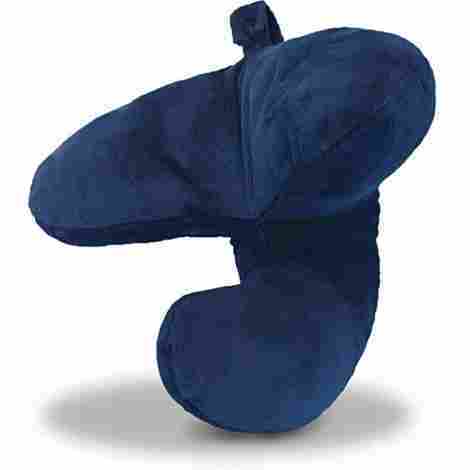 This is a simple u-shaped travel pillow with a spin, but this company sells many, so there is something to be said about that. We like that it comes in different sizes and colors. The pillow gives moderate support, but for those heavy sleepers, you may need something a bit stronger and more sturdy. We think it's a little costly for what this pillow has to offer. “Sleep is over-rated”, we’ve all heard this – many, many times. Of course, most times, it is said, “tongue in cheek”. We all know how significant sleep is and catching up on your sleep while traveling is time really well spent! Some folks are capable of sleeping anywhere, and I used to be “that person”. However, most people struggle to sleep sitting up, in strange unfamiliar places without the comforts of home. We here at DrivrZone want to help you become a more seasoned travel sleeper. These are the Top 10 Travel Pillows, reviewed and rated for quality. Criteria used for our process was extensive, and we want to share with you what we looked for with all our products. There is no uncertainty in our minds, you do not want to lay your face into a dirty travel pillow, nor do we want you too. When analyzing these travel pillows, we chose pillows that had removable covers that could be tossed into a washing machine for easy cleaning. Some of the travel pillows that do not have covers can be thoroughly washed in its entirety (we suggest a delicate cycle for those). We recommend that you wash your pillow cover frequently to avoid germs and dirt build-up that can accumulate while using (drool, lotions, cologne, lipstick). As with everything we purchase, be sure to read the washing instructions before proceeding. Quality material usually washes well! Which brings us to the material. We want to make sure when you are ready to settle into your seat for that well-deserved nap, the material that is placed around your neck and touching your face is soft and delicate. It is highly doubtful there are any travelers that favor a cheap, plastic, or sandpaper-like feeling on their skin. The travel pillows on our list here today are made from a variety of quality fabrics. Some softer and more durable than others which is why they are ranked higher on our list. The fabrics we rated for quality are cotton microfiber, bamboo cotton, velour, memory foam, soft polyester, plush fleece, hypoallergenic, antimicrobial, and temperature sensitive materials with built-in ventilation for air to move freely allowing for a more comfortable sleep experience. Some of the pillows that we reviewed hang around the back of your neck, some of them twist and fold completely around your neck … and then we reviewed some that do a lot more than just “hang around”. We were careful when reviewing for versatility. No two people are alike; such is the same with travel pillows. We really liked the travel pillows that were more customizable for a more individual personal fit. Fact: We know you came to DrivrZone today because you wanted to expand your knowledge of the ever so popular travel pillows. Fact: We are thrilled that you are here and recognize the time you take to do your research. Fact: An educated consumer is a happy consumer. Fact: Money is important (to most), and purchasing a solid quality travel pillow at an affordable price is – superb! Today we reviewed and rated a wide variety of travel pillows for you. We broke them down in an easy to read format so you too can narrow them down and mindfully choose the ideal travel pillow for your personal needs and budget. We certainly hope we were helpful and were able to clarify a few things along the way in order for you to choose the suitable travel pillow, the one that gives you the precise support where you need it most, and with pleasing features that are important to you, at a cost that is affordable for your financial budget. Sleep is over-rated? We think not! We want you to find that travel pillow that delivers a more peaceful rest when you are road-tripping across the states, traveling abroad, or even cruising the world wide web! Do you travel daily, weekly, or only occasionally for vacations and road-trips? If you are going to be using your pillow frequently, know that your purchase will be a healthy investment, and your body will thank you! We recommend that you purchase the best travel pillow within your budget. A better quality pillow will give you the best support that you need. Find one that can wash with ease, allowing your pillow to remain refreshing and clean for years to come! Q: Are travel pillows all washable? A: No. Some travel pillows are not washable, and you will have to read the instruction label before you attempt to clean it. The better-quality pillows are normally washable. You will find that some will come with pillow covers that can be slipped off and tossed into a washing machine. Some certain materials, allow for the entire pillow to be put into the washing machines on a delicate cycle and cool dry. While others are water-resistant, meaning they can be wiped with a damp cloth. Q: Are travel pillows universal in size? A: Travel pillows will usually read “one size fits most”, but some actually are available in multiple sizes. Child/Youth sizes and adult sizes will run S, M, L, XL, XXL. We did see a few that go by neck sizes for a more custom fit. Q: How do you store travel pillows? A: Some travel pillows do come with a carrying tote, and some come with little clips that you can clip on to a travel bag, luggage, or a satchel. Some can be compressed and put into a small case for easy packing. The larger non-collapsible travel pillows that are built with strong memory foam and are ergo-friendly, are more bulky for storage, but they are definitely suited for the heaviest of sleepers, giving the most neck support. It all depends on what you are most important to you when shopping for your pillow. Q: Are travel pillows for head support only? A: Travel pillows are designed to support many stress points. Supporting the head, neck, and chin are very important to prevent pain and tension, allowing for a more peaceful sleep. Some pillows are super versatile and can be used under your knees for muscle aches and behind the back for the lumbar spine support. Be sure you do your research before you purchase the perfect travel pillow!